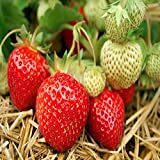 25 Earliglow Strawberry Plants - Bareroot - The Earliest Berry! 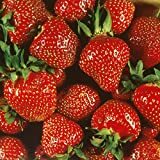 Seascape Beauty Everbearing 25 Live Strawberry Plants, Non GMO, by Hand Picked Nursery. 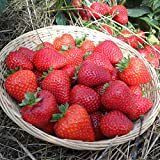 Strawberry bush for sale are cuttings or runners propagated in nurseries and are sold by bunch. It is recommended to buy disease-resistant varieties in the spring and plant them as soon as the soil is workable. 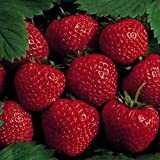 Ever bearing strawberries are the most popular variety because it keeps on a growing for a good 5 years and more. Strawberries bloom in the early spring and usually take 4 – 6 weeks before you can harvest its fruits. Location – Place your strawberries in an area where it will receive at least 8 hours of full sun each day. The more sun your plant gets, the bigger and tastier their fruits will be. Do not plant in site that recently had tomatoes, peppers, strawberries, or eggplants to avoid transfer of disease to your new plant. You could also grow strawberry plants indoors if your climate is not suitable to grow them outside. Soil – These plants prefer a slightly acidic soil with pH between 5.5 and 6.8. 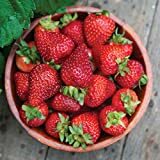 It is best to grow strawberries in containers if your area is naturally alkaline. Amend heavy clay soil by putting composted leaves, rotted sawdust or any bulky type of organic matter before planting. Rake the soil into raised beds to improve the drainage. Space your strawberry plants 18 inches apart. Do not plant too deep. The roots should be well covered with soil but the crown must remain exposed to light and fresh air. Keep the moist soil by mulching with black plastic or pine straw. 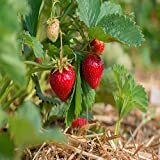 Water – Water right after planting your strawberry plant. Due to its shallow roots, it is important to keep the soil moist at all times. Water them adequately with about an inch per week or more when the runners and flowers are developing. Pests / Diseases – Fungal disease is rampant in the summer and may cause dark spots to form on the leaves of your plants. Prevent this by clipping strawberry foliage and raking it away from the plant. Birds are also notorious for picking on your fruits. To keep them away, cover your strawberries with lightweight bird netting once the berries begin to ripen. Pruning – Pick off blossoms in the first year of your strawberry plants to discourage fruiting. This will make the plant focused on developing healthy roots and the yields, in turn, will be much greater in the next year. Also eliminate some of the runners and daughter plants for the same reason. Harvesting – It is best to pick strawberries in the morning when the fruits are cool. Harvest only fully red berries and pick every 3 days. Do not pull the berries, instead cut them by stem. Immediately place them in the refrigerator and wait until just before your eat them to rinse the berries with cool water. Your harvest time will last up to 3 weeks. Bumper crops can be frozen, dried or made into jam or preserves.